Back in the 1990s when I was doing quite a few recording sessions as a guitar player some interesting situations and requests would arise. One day I received a call from a producer who wanted to book me for an ‘Overdub’ session. 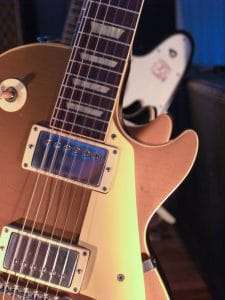 This can mean anything from replacing existing guitar parts played by someone else – often the guitarist in the act – or creating the final part to make the song sound finished. They pull out this Roland pedal board with presets and go to a patch that says “Les Paul / Marshall”. Upon further investigation we discover that the preset has chorus, echo and reverb on it and this is what they think is the legendary sound. So we add in those effects and the client was happy. I’ve gotta say that the real thing was way better than the copy. The client went away happy and I realised that not many people get to hear the real thing so the imitation is what they believe to be what the real thing sounds like.